Optimally-adapted AFM probes can now be produced by 3D laser lithography at KIT. Photos: KIT. An atomic force microscope (AFM) can reveal the surface nanostructure of a material by scanning it with a fine probe on the end of a measurement needle. Researchers at Karlsruhe Institute of Technology (KIT) in Germany have now succeeded in using 3D laser lithography, a form of 3D printing that can produce structures at nanometer scales, to produce suitable AFM probes for any application. Their work is described in a paper in Applied Physics Letters. AFMs are used to analyze surfaces at the atomic level, but require different probes for different materials and applications. Some materials require probes with a special shape or very long probes that can scan deep depressions in a material. KIT researchers have now succeeded in producing probes that are optimally adapted for each requirement. “Biological surfaces, such as the petals of tulips or roses, frequently have very deep structures with high hills,” explains Hendrik Hölscher, head of the Scanning Probe Technologies Group at KIT’s Institute of Microstructure Technology. 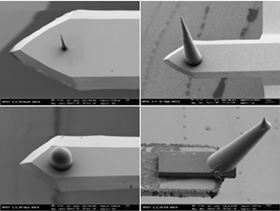 Commercially-available probes are typically 15µm long, pyramid-shaped and relatively wide, Hölscher points out. Although probes with other shapes are offered, they have to be produced manually, which makes them very expensive. The KIT researchers have now succeeded in using 3D laser lithography to produce probes of any shape and with a radius down to just 25nm. This 3D lithography process was developed by KIT and commercialized by Nanoscribe, a spinoff from KIT. It is based on two-photon polymerization: strongly focused laser pulses are applied to harden light-sensitive materials after the desired structures have been produced. The hardened structures are then separated from the surrounding, non-exposed material. “In this way, the perfect probe can be produced for any sample to be studied,” Hölscher says. The probes produced by this process can be placed on conventional, commercially-available measurement needles and are hardly subject to any wear. They are perfectly suited for studying biological samples, as well as nanometer-sized technical and optical components. rp+m has acquired a M2 cusing metal additive machine from Concept Laser for research & development purposes. Outdoor decking company Composite Prime has formed a distribution partnership with PVC-U company GAP. UK decking company Composite Prime has been awarded membership of the Timber Trade Federation (TTF).